This image is a 1 gigapixel version of the original 1.8 gigapixel stitch consisting of 400+ images shot with a Nikon 18-200 mm lens on a Fuji S5 Pro. I cropped and scaled the image down because the additional .8 gigapixel did not add all that much to the image experience, yet it added another 300 Mb to the zoomable image. Those looking closely at the image may find that the image has been doctored. Duh! It's a composite of 400+ individual shots. But the image is more 'doctored' than strictly necessary for the period of time it takes to shoot the photos. The first reason is that the weather during the Air Race in Rotterdam was lousy. Lighting conditions changed every couple of minutes, and there was an almost constant drizzle. Secondly, it just made the image more interesting to look at. Spotting a single Red Bull plane is fun, but seeing it do half a lap is more fun. One or two small boats are fun, but adding the Eurodam which started its maiden voyage one and a half week before adds more to look at. And sunbathers are more fun to spot than grass in an empty park. Most of the gigapixel panorama was shot on juli 14th: 367 shots in about 45 minutes. 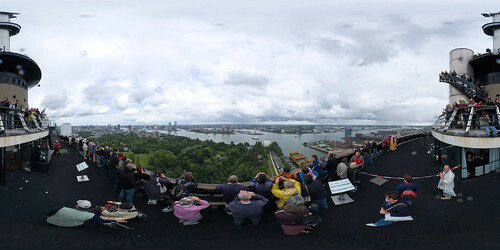 I had to go back up the Euromast two days later, because my camera 'jammed' a couple of times which meant there were a couple of 'holes' in the panorama. The big ship near the Erasmus bridge, as well as some of the sunbathers were shot on juli 4th, and the pilons, planes and choppers were shot on juli 20th. The base panorama was shot using the panorama robot I am working on, and stitched using PTGui. Individual shots from the other days were then manually blended in with the base layer in Photoshop, resulting in a layered file of a whopping 7.2 gigabyte. This file takes about 55 minutes to load in Photoshop, but after that most manipulations are surprisingly smooth. The additions from juli 20th were hardest to blend in place, because the weather was dramatically different that day. I wanted to start making panoramic photos like these. Do you have any advice on what I should get? I read that you use at Fujji S2 right now. I dont know much a photography, can a regular sony cybershot do this or do i need something better? Iwas looking at one of those canon eos or nikon 60D cameras.